Tim Hightower is one of the best stories in football for the past couple years. He was out of football completely for 4 years, joined the Saints last season and recorded 504 yards from scrimmage with 3 starts. Last week, Mark Ingram fumbled in the first quarter and Hightower took over for 100+ yards on the ground. If they’re willing to feed Hightower the rock for 3 quarters over a healthy former Heisman winner and regular starter, it’s hard to imagine the touches will dip too much. Hightower says he didn’t feel comfortable in the system last year. He seemed pretty dang comfortable down the stretch when Fantasy owners needed him most, right? The Saints play the 49ers this week, who are giving up more rush yards than anyone in the league this season…1,136 to be exact. The Niners are on a record pace, and not in a good way. Hightower should be hungry to eat, regardless of his role on Sunday. Based on the potential for volume, I lean toward Charcandrick West. While Jacksonville is proven to be very good against pass catching running backs, the Chiefs offense goes through their starter. When it comes to wide receivers in the flex, if I don’t seem them producing in the Top 25 at the position I can’t justify starting them. It’s hard to feel confident about Jordan Matthews against Janoris Jenkins. Mark Ingram’s time-share status makes it difficult to start over an expected full-time back like West. The Lions are too bad against tight ends to not start Kyle Rudolph. I am not an oddsmaker, so I never know what to do with questions like that. Ben Roethlisberger took more snaps each day leading up to his game against the Ravens and the Pittsburgh Post-Gazette expects him to start, barring a random setback. Have more Fantasy lineup questions? Don’t hesitate to ask on Facebook or Twitter. Michael’s Note: Now that the World Series is over, I should have more time to be more timely answering Fantasy Football questions and can include more content. Thank you for your patience during the Cubs’ historic run. Foster has retired. Drake is…hey, where is Drake? And Ajayi has recorded back-to-back weeks of 200+ rush yards. If you saw that coming when the season started, STOP IT NO YOU DIDN’T! Ajayi is on a bye this week, but expect him to continue seeing 20 touches or more going forward. RB – Frank Gore is going to be your guy this weekend. Outside of not trusting the Vikings offense, Frank Gore is the safe bet for his consistency…which bodes well against a very average run defense. WR – Expect Vernon Hargreaves to cover Amari Cooper, which leads the one of the league’s touchdown leaders, Michael Crabtree, to eat against either Alterraun Verner and Brent Grimes. Sorry I was late on the Allen Robinson portion of your question. Randall Cobb will be your best choice, after the fact. He has seen double-digit targets in each of the last 3 weeks and won’t be drawing Desmond Trufant. Falcons-Packers has shootout potential too. Don’t love your options but Demaryius Targaryen has the best matchup and is far more talented than the either two, despite his numbers in the previous meeting. Don’t love your options either, but you’re leaning the right way…Jordan Matthews is your guy. Can we talk about LeSean McCoy for a minute? McCoy is 150 yards from scrimmage away from surpassing both Shaun Alexander and Marshawn Lynch for 39th on the all-time list. Among backs with 10,000 career yards total, McCoy ranks 7th all-time with 4.7 yards per carry. When many (me included) thought he was close to being done, he proved to us that he is still an elite back in the league after scoring 7 touchdowns this season(2nd in the NFL). He is set to face a Miami defense that is allowing the 4th most rush yards to opposing RBs. He left practice early this week with hamstring tightness and should be worth monitoring before kickoff though. If healthy, McCoy will be a great play this week. If not, be ready to pick up Mike Gillislee. It’s never comfortable to play someone on Thursday Night, but Cameron Meredith is legitimate play this week against a Packers defense that is missing its TOP 3 defensive backs. He ranks 3rd in receiving yards and 1st in receptions over the last 2 weeks. Meredith is also a favorite of Brian Hoyers when in the red zone. While I DO believe in Kenny Britt, you have to play Meredith. If Jordan Reed sits, you should go with Vernon Davis. If he doesn’t, Charles Clay is your next best play against a Dolphins defense that has allowed touchdowns to tight ends in 2 of their last 4 games. TE: Anyone who had Coby Fleener a week ago (*raises hand*) finally got to unleash the power of an athletic tight end in Sean Payton’s system. This week, however, I would recommend going with Kyle Rudolph. He is second among TEs in touchdowns and is averaging 7.4 targets per game. He is also getting 40% of the Vikings red zone targets and it’s hard to pass on that consistency. WR: I feel bad about this because I do really like Kenny Britt going forward, but Julian Edelman is healthier and on the Tom Brady Revenge tour. If it doesn’t all come together this weekend against a Steeler’s defense that will be too busy with the tight ends, then bench him. DEF: Seattle is the better defense but I like Cincinnati’s matchup WAY MORE. QB: It’s time to unleash #HoyerTheDestroyer. The highest scoring non-quarterback in Fantasy Football right now is David Johnson (aka #DJ2K). He added two touchdowns and 157 rush yards to his total last week against San Francisco. Johnson has gained over 100 yards from scrimmage in every game, so far this season, and faces a Jets defense that has allowed 16 receptions, 125 yards and two touchdowns to running backs in the last two weeks. He may not see as many carries as he got against the 49ers (27) because Carson Palmer is set to return, but you can count on his receiving skills to do some heavy damage against the J-E-T-S…blah blah blah. TE: The perennially slow starting Seahawks offense seems to have found a connection between Russell Wilson and Jimmy Graham. Graham has recorded back-to-back 100-yard performances for the first time since 2003. The Falcons are also the second worst (to the Browns) at giving up TDs to the position. Flex: Jordan Howard recorded the 9th most yards from scrimmage by a rookie in Bears franchise history. Names like Anthony Thomas, James Allen, and yes…Walter Payton…produced better games in their first year, and just by up to 30 yards. In terms of matchups, Howard doesn’t have an easy one in Jacksonville. They have allowed 104 rush yards per game and only 2 touchdowns on the ground. Based on the volume Howard gets in the Bears offense (running and receiving) you can’t let him sit. DEF: I’m not sure about the Panthers in the long-term, due to their young secondary being taken advantage of nearly every weekend and having one takeaway in their last 3 games. Short term, their matchup with the Saints has shootout potential, and that’s bad for any defense. I like your Titans pick against Cody Kessler and the Browns. The Titans are making a lot of noise with back-to-back multi-interception games and ranking 6th in sacks. Steve Sr. is (1) not a tight end and (2) dealing with an ankle injury that knocked him out of last week’s game. Go with James White. If I learned anything last week, it’s not to doubt Devonta Freeman. Against the best defense in football, Freeman totaled 123 yards and a touchdown. You can look at the yards per carry as a negative, but 26 touches is proof he is Atlanta’s every down back (with Coleman getting his work receiving). The upside is in Freeman’s favor, while Frank Gore will give you either 75+ yards or a touchdown…like he has in every game so far this season. Up to you. TE: In the Brian Hoyer era for Chicago, Zach Miller is averaging 6 catches, 61 yards and a touchdown. While Hoyer is spreading the ball around, he does seem to have favorite targets in 3rd down situations and Miller is one of them. Keep riding that train as Zach Ertz is facing a defense that gave up less than 60 yards to both Gary Barnidge and Dennis Pitta. Flex: Matt Forte is that guy we all want to love (with good reason) but we really shouldn’t. He hasn’t done anything close to his monster Week 2 and Bilal Powell is taking more and more pass targets away from him. I also don’t think this will be a good week to play Travis Benjamin. As you know, Broncos are probably looking for blood on Thursday Night Football this evening. Jordan Matthews is your best call. Well, Quincy Enunwa would’ve been a pretty great pickup. Sammie Coates would be outstanding, if you can find him. Outside of those two? Chris Hogan, Jeremy Kerley and Devante Adams are decent week-to-week fill-ins, but I would try to make a trade if you are looking for a dependable solution for the rest of the season. Melvin Gordon is going to get the touches against a Broncos D (that has given up the 10th most points to RBs) and has averaged a score in every game. If I’m looking for a safer play though, it’s Kelvin Benjamin against the Saints. They have allowed 86+ yards to 6 different receivers in 4 games and are letting quarterbacks just CHUCK IT on them. Love the shootout potential at the Superdome this weekend, Cam Newton or not. Did you have either Julio Jones or Matt Ryan in your lineup last week? Both? Or did you leave one on your bench because you underestimated how good they are paired together? It’s hard to doubt these two again for a while, right? They (the unstoppable force) take on Denver (an immovable object). Ryan is the the highest scoring quarterback in Fantasy Football. The Denver defense leads the league in sacks, have only allowed 1 touchdown reception (to Kelvin Benjamin) and have allowed just 3 receptions on 7 targets in the red zone. X-Factor? Julio being Julio. He’s a Mutant and likely future X-Men, so there’s that. TE: You have a strong predicament there, considering both TEs are facing really terrible defenses. With Tom Brady returning and Rob Gronkowski back to 100%, I feel more comfortable with Zach Miller’s targets this weekend than Martysaurus Rex. Miller is definitely going to be depended on more with the loss of Kevin White and he is going up against The Replacements…being the Colts linebackers. Matt Ryan is playing like the best quarterback in football right now. The Eagles defense hasn’t allowed a passing touchdown yet this season. The Falcons run game helps setup Ryan and his receivers better, even against the Broncos defense. RB: I like Giovani Bernard’s ability in open space against Dallas much more than Tevin Coleman having to play second fiddle against the Broncos. WR: Sammy Coates was one of the best WR pickups you could snag on the waiver-wire this week but I like Quincy Enunwa much more in this matchup, with Eric Decker likely to sit out. Steeler’s are ranked 30th in defending #2 WRs. QB: I’m shocked Philip Rivers is available in your league. If you can get him, play him. The Raiders are THE WORST at defending pass yards and are in the bottom 3rd in allowing pass touchdowns. DEF: The Rams will be your best bet this weekend, as they are SMOTHERING quarterbacks this year and not even Tyrod Taylor can out run Aaron Donald. TE: Ertz. Carson Wentz loves throwing to his tight end and the Lions haven’t figured out how to defend the position in the past season and a half. WR: For the reasons I like Philip Rivers above, I REALLY like Travis Benjamin. You don’t have a bad play though, considering Jordan Matthews plays out of the slot and will do so in a very good matchup. The Lions allow the 6th most fantasy points against receivers. I also don’t feel good about Stafford this week, but if you can stream a QB…go with #HoyerTheDestroyer. He has 300+ yards and 2 TDs in each of his past 2 starts and it should continue this weekend against a Colts defense that has 3 TDs to 2 of the 4 QBs they have played against this year. QB: I feel better about Wentz against the Lions than I do Jameis repeating Matt Ryan’s murderous work. I don’t think you’ll be particularly wrong with either though. RB: GAH…it pains me to say it because I’m not a big fan of his Fantasy prowess (love him as a person though) but you have to go with Frank Gore in this matchup. Davonta Freeman is facing the best defense in football. Gore is not. We don’t normally do Keeper League things on here, but I do want to talk about Kevin White. White was getting better every week before he was placed on IR. He had more receptions than any Bears receiver in their first 4 games. I think it depends on how desperate you are for an extra roster spot, what’s available, who will emerge to pickup for your draft next year…I haven’t given up on White’s potential and I like the prospects of him playing with a new quarterback in 2017. The best thing in this trade appears to be Michael Crabtree. 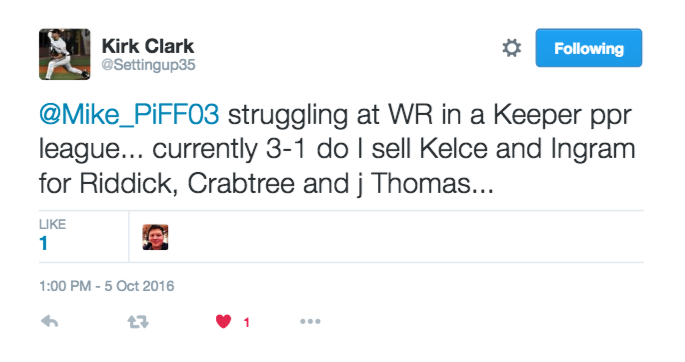 Problem is…Kelce has all the ability to be a top end Tight End and could be elite paired with a Top 10 quarterback. You don’t seem to be needy for a major trade but Crabtree would help you in the short run…Kelce would help you in the long run. I’ll let you decide. Bears safety Chris Prosinski was just minding his own business, serving as a backup on defense and contributing on special teams. Next thing you know, he’s forced into the game because of injuries and is immortalized on posters for years to come…because Ezekiel Elliott did this to him. Aside from the shame that Prosinski has to harbor, in film sessions and highlight shows for years to come, the Cowboys have something special on their hands. Elliott had his coming out party against Chicago on Sunday Night Football last week, rushing for 140 yards and adding 20 more receiving. He was a workhorse down the stretch. Gashing a beat up Bears defense, but running harder on every down. He is currently the league’s 3rd leading rusher, with 2 touchdowns, and should only impress more behind the NFL’s best offensive line. The Cowboys are also led by another rookie at quarterback, who is making a lot of us wonder how he fell to the 4th round in this year’s draft. Dak Prescott doesn’t have gaudy numbers, yet, but he appears to be looking better by the week. He threw his first career touchdown pass in Week 3, averages 33 attempts per game, and goes up against the 28th ranked pass defense on Sunday (San Francisco). He won’t necessarily carry your team, but a spot start by Prescott doesn’t appear shabby in Week 4 if you need one. Terrelle Pryor became the first player in NFL history to record over 140 receiving yards, 20 rushing yards, and 30 passing yards all in the same game. He is the Browns’ best source for offense and even played safety, at one point, against the Dolphins in Week 3. You can also tell that Cleveland coach Hue Jackson is scheming specifically to put the ball in Pryor’s hands AND in open space…because why wouldn’t you, when the guy is 6’6, 240 pounds and can run a 4.4 40-second drill. Christine Michael looked like he was in a video game in the first quarter against San Francisco in week 3. 9 carries, 71 yards and 2 touchdowns (the first on his first touch for 41 yards). He came back to Earth though, only rushing for 35 on 3.1 yards per carry after that. Michael is the guy many people have waited on, with all the physical tools to be a star in the league. The injuries Thomas Rawls has dealt with have given Michael his 3rd or 4th chance to prove it, as it seems. He has a tough matchup this week against the Jets, a Top-3 rush defense. If Dez Bryant plays, he’ll be doing so with a fractured knee…So, I’ll let you decide on that one. For PPR’s sake, you’ll for sure want to start Mark Ingram. The Chargers are allowing NINE CATCHES PER GAME to running backs, so far this season. Being without Manti Teo (who is still without his imaginary girlfriend. Sorry too easy), makes the Chargers way more susceptible to the run. Carlos Hyde may have gone off on the Seahawks, but they didn’t allow Arian Foster or Todd Gurley to go over 51 yards the weeks prior. Travis Benjamin will continue to get is targets and shoot EAT against the Saints secondary. The Giants have done some impressive things rushing the passer and against the run, but they are THE WORST against the pass through 3 weeks this season. Stefon Diggs should be in for a solid day of receiving yards on Sunday. Despite facing his toughest matchup of the season, I have to recommend Mike Evans over Emmanuel Sanders because he is 2nd in targets this season to Antonio Brown. Jameis Winston may not play particularly well, but you can count on him at least throwing it Evans’ way. League leader in receiving yards Marvin Jones against the depleted Bears secondary. Then Brandin Cooks, for the real potential of a shootout with San Diego. You have to play Julio Jones if you have him. Last week was a bit of an enigma with him. Look for Julio to take advantage of a young Panthers secondary that has only faced Trevor Siemian, Blaine Gabbert, and Sam Bradford so far this season and Matt Ryan has all of a sudden shown up as a top quarterback again. I get the temptation for Marvin Jones, but Julio is far more proven and that deal needs to be sweetened much more for me to trade him. Hey man, I just give advice. I don’t lock your lineup for you. After all the running back injuries last weekend, it seems the best course would be to tread lightly…when claiming a fill-in. After Jonathan Stewart went down with a hamstring injury, Whittaker took over with 100 yards rushing on 16 carries (6.25 yards per carry). Stewart isn’t expected to be out very long, but you can’t expect the Panthers to increase the potential for Cam Newton to get hurt on more quarterback draw plays. Whittaker has the talent to be effective with a lead back’s workload. Cameron Artis-Payne and Mike Tolbert will be in the rotation for touches, but the majority should go to Whittaker…who recorded nearly a quarter of his 3-year career rush total just last week. There are 3 running backs, not named Adrian Peterson, who are looking to shine on the Vikings roster. Matt Asiata is a goal line vulture, with short-yardage power. Ronnie Hillman landed from Denver, not too long ago, and has the ability to be a flash-in-the-pan every once in a while. Then there’s Jerick McKinnon, who may be the most talented of the 3 and should be counted on for his pass-catching and breakaway speed. Your best bet is McKinnon for those exact reasons, and because the Vikings could be playing from behind against Newton and the now high-flying Panthers offense. These two rookie running backs should be on your radar. Dixon is on his way back from injury, but worth stashing once he returns. Neither Justin Forsett or Terrance West have done enough to claim the #1 RB role in Baltimore, and Dixon is one of the most talented players to come out of the draft…Going down the coast, we find Drake getting an opportunity to earn #1 type work over Jay Ajayi while Arian Foster deals with the thing that’s plagued him since 2013…injuries. Drake ran in a touchdown last week, and Ajayi has been a healthy scratch for Dolphins once already this season. RB2 – You’ve got really good problem on your hands. Both players have great matchups, but I like Gordon’s situation more. The Chargers signed Dexter McCluster to fill in for the Woodhead role, but realistically he still needs to learn the offense. The Colts are also incredibly banged up on defense. The 2015 version of myself wouldn’t believe I’m saying this, but go with Melvin Gordon. Flex – I understand the concern not wanting to stack a RB & WR from the same team, but Ken Whisenhunt has brought some serious fire power back to the Chargers’ offensive play-calling. On top of Woodhead and Allen being hurt, the Chargers may also be without Antonio Gates this weekend. Travis Benjamin should be a target monster. I would respond by asking, who is available? The Chiefs had a solid bounce back last week with 2 sacks and 2 picks, while also holding one of the more potent offenses in football to under 20 points. The Jets looked pretty dangerous a week ago against a pretty messed up Bills squad, but they could be just as prone for turnovers…as FitzMagic proved at the end of last season. Tweet me your other Defensive options at @Mike_PiFF03. Not Golden Tate. As a Golden Tate enthusiast before the season, I’ve got pretty hard feelings toward his production in the first two weeks. Atlanta’s secondary has been LIT UP 2 weeks in a row, and Brandin Cooks is just the spark for another deep bomb of a TD (or 2). Jordan Matthews has recorded 100 yards or a touchdown in 6 of his last 8 games. You can trust him more than Demaryius Targaryen, which is very tough for me to say. FLEX – Gordon for the reasons above. WR – T.Y. Hilton becomes more valuable with Moncrief being injured. I love Will Fuller but it’s hard to trust players to play at their best on Thursday night. I don’t love going against Carson Palmer, but I do love most quarterbacks facing the Saints secondary. They will likely be without P.J. Williams and Delvin Breaux and it’s obscene that Eli Manning didn’t score more points on them. Go with Matt Ryan. I know Sproles is tempting, but you must resist. Ryan Matthews is proving that his nose for then end zone is too strong to deny.